Working from home a bit of work on a funding application, sat at the table and just glanced out of our glass door overlooking the garden. Hello. I am a brand new follower. I saw your post on Coy Little House. What is that creature? It looks like a guinea pig but I see a tail. Beautiful pictures. Come see my blog . Hello Debby thank you for following my blog. I am fairly sure its a field mouse but some of my friends think its a vole. He is gorgeous - do you think that he is a wood mouse or a harvest mouse? I thought it was maybe a field mouse but will research a bit further. I do love woodpeckers. They are just starting to drum in the trees. She is watching you closely! We hear a symphony of birds all day long in our tree, but we rarely see any. Thank you for your comment Carol, we see dozens everyday. Photo's taken through a glass patio door about 3ft away from feeder, I was so excited first time I have seen a woodpecker. The mouse looks a lot like our field mice, but is brown, ours are grey. It looks healthy. 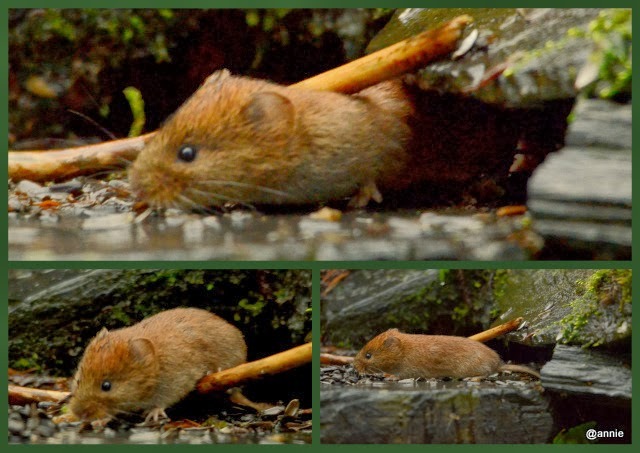 Looks like a vole to me too, the short ears and if it has a short tail I'm sure it is. Beautiful though and lovely to have around. Love the woodpecker image. Annie dear, how exciting to have new visitors to the garden - love the field mouse's color, and the woody is gorgeous, as are all of these spectacular birds. Nature is so amazing.